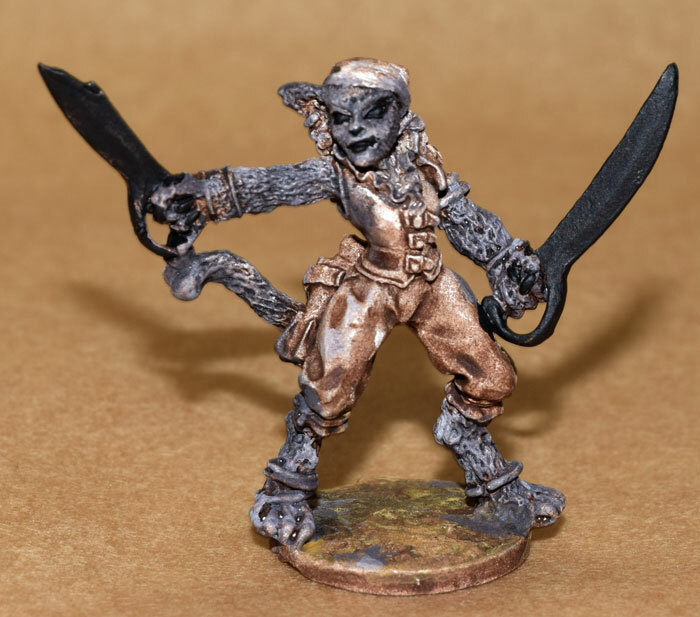 This is a catgirl pirate ( "Nyamaunir-Piratin"), figure #15503C from Das Schwarze Auge, produced under license by Ral Partha Europe (which is not Ral Partha). She is a wee bit on the small side. Here from left to right are a cat person (Khaliman) from the French "Alkemy" game, our little kee kat pirate, Reaper's 77340: Avatar of Sekhmet, and Reaper's 03478: Tawny Firehair, Cat Girl. Here she is up close. 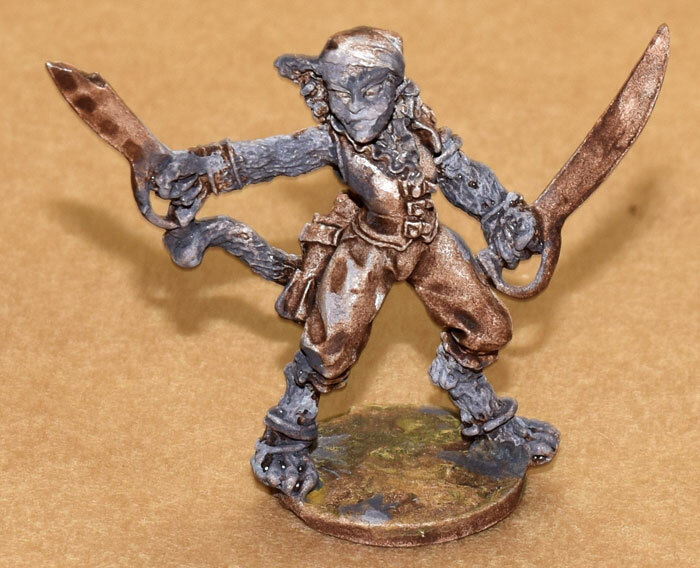 She has some nice details and a more fuzzy appearance than most of the cat people minis I've seen. This is my standard priming: A thinned coat of Titanium White allowed to dry for a full day, then a wash with thinned Burnt Umber. 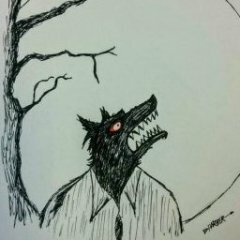 It's related to Renaissance painting techniques and I find it gives a good warm foundation to start from. 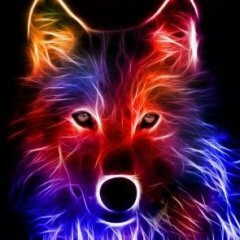 I was painting her at the same time as some wolves, for economy of paint. I figure I'm going to paint her like a grey cat. The first coat of paint is a light grey mixed from Ultramarine Blue and Burnt Sienna, lightened a good deal with white. It may be noticed I'm a little casual how I apply my paint. There are bits not covered and the paint has been thinned down and it isn't always the same opacity because of that and the under-brown shows through. I mixed a slightly more translucent, darker version of the same grey and added some more. Then I took some matte pure Carbon Black and indicated in her eyes, nose, mouth, and claws. 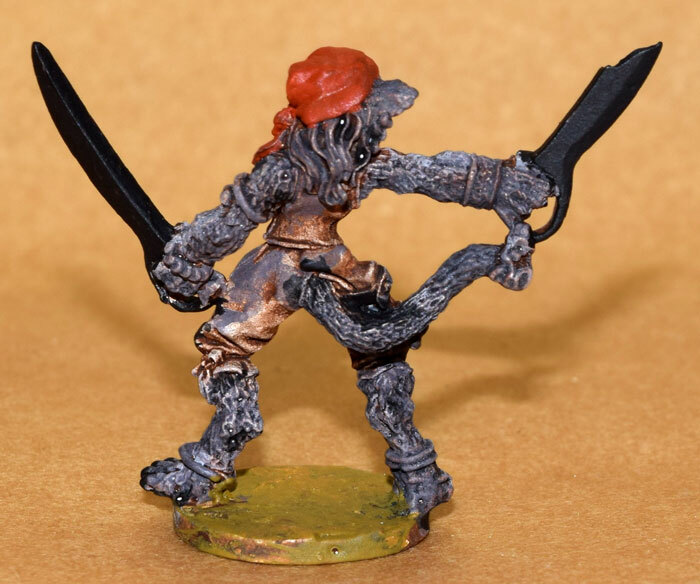 I put an undercoat of black on her sabers as long as I was at it, since I find it looks very good under silver. 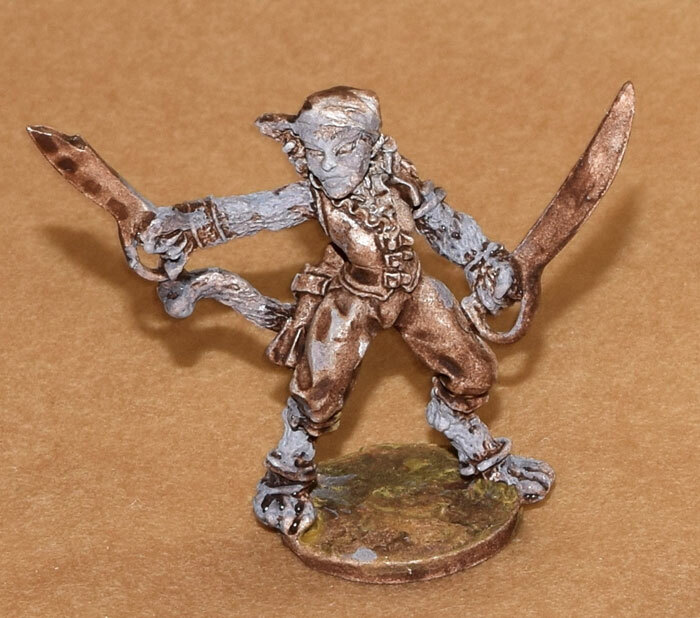 I have some DSA minis, they were originally from a German Company named Hobby Products, the same company that made the Demonworld 15mm Game. 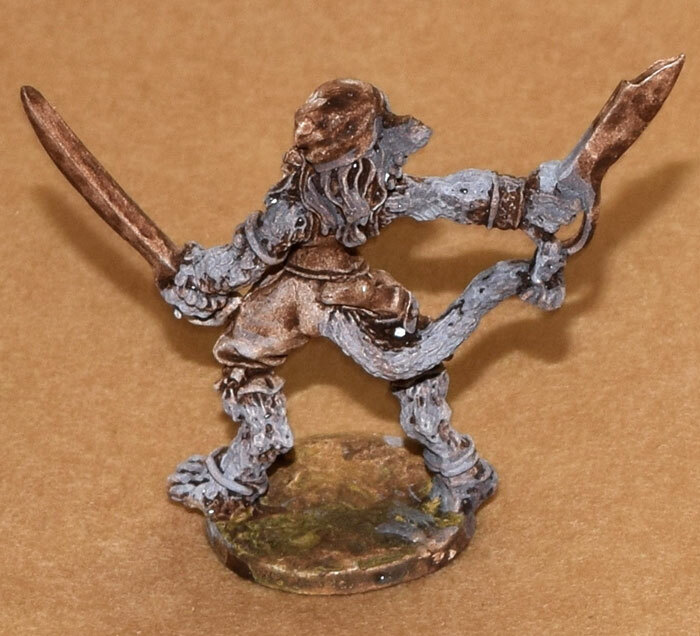 Ral Partha Europe still sells both lines. Yeah, very neat figure, had never seen that one before! Can't wait to ser her progress! Just tossed a little Red Iron Oxide as a base coat on her head bandanna. Are you going to put dots or stripes on the bandana? Aren't red bandannas always paisely? 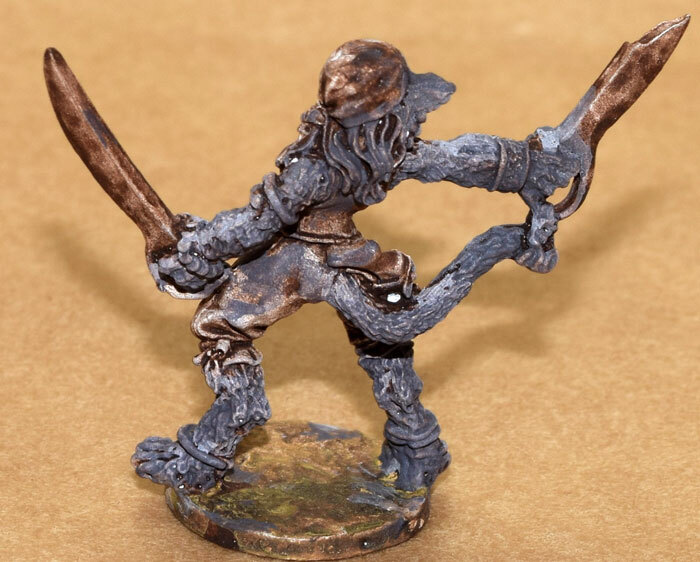 Johnny Lauck, who retired his Mega Miniatures business recently, ran a few Kickstarters before he retired in order to let people order some sets. 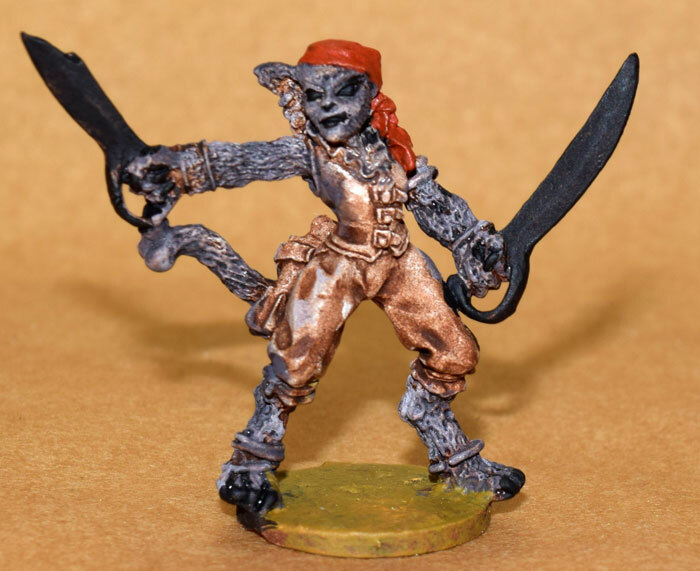 A couple of years ago he ran one of a cat-people dungeon crawl party. I saw some people here regret they were going out of circulation. 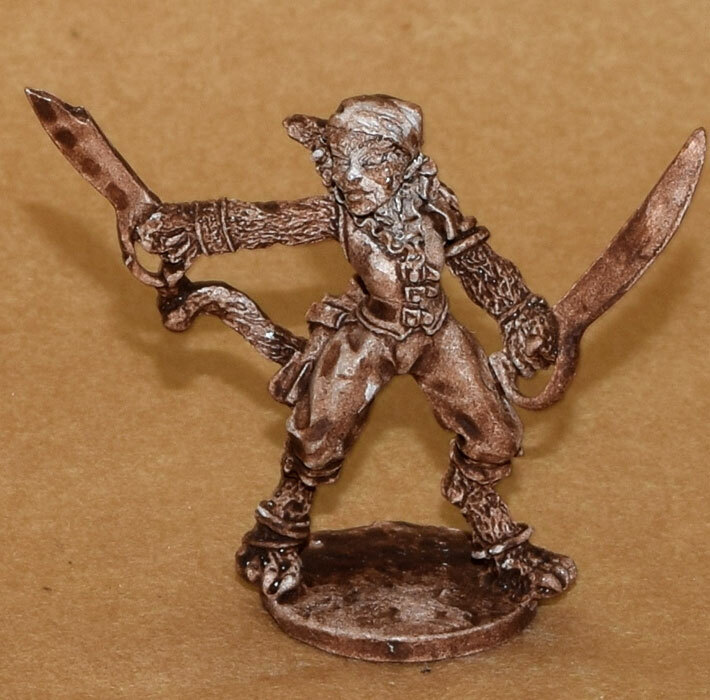 Well, apparently Armorcast has picked up the license and is offering half a dozen anthropomorphic cat-people dungeoneers. They have an Old School vibe I rather like.